'apparent competition', and what others have called 'competition for enemy-free space' (Jeffries & Lawton, 1984, 1985). interactions are summarized in Figure 8.15, which shows that from the point of view of the two prey species, the signs of the interactions are indistinguishable from those that would apply in the indirect interaction of two species competing for a single resource (exploitation competition). In the present case there appears to be no limiting resource. Hence, the term 'apparent competition'. In an experiment involving a parasitoid (the ichneumonid wasp Venturia canescens) and two caterpillar hosts (Plodia interpunctella and Ephestia kuehniella), Bonsall and Hassell (1997) allowed free passage of the parasitoid between the host species but kept the hosts apart to avoid the possibility of resource competition between them. 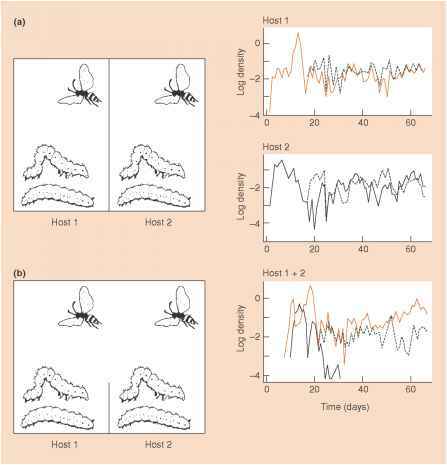 When the experimental chambers contained just a single host species together with the parasitoid, both the parasite and host persisted and exhibited damped oscillations in population size, tending towards a stable equilibrium (Figure 8.16). 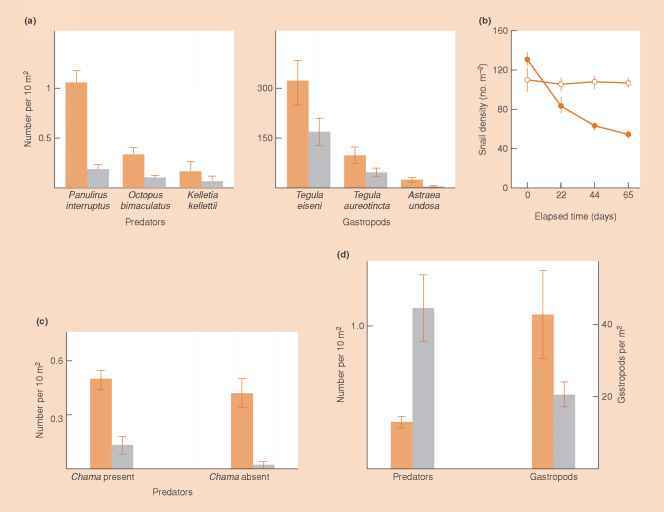 But when the system was run with both host species, the parasitoid had a greater impact on the species with the lower intrinsic rate of increase (E. kuehniella). This host showed increasing population oscillations and invariably went extinct. By means of their elegant experimental design, Bonsall and Hassell were able to demonstrate the effect of apparent competition in a situation where resource competition between the caterpillar species was ruled out. While the term 'apparent competition' is entirely appropriate, it is sometimes useful to think of 'enemy-free space' as the limiting resource for which prey (or host) species compete. This is because the persistence of prey species 1 will be favored by avoiding attacks from the predator, which we know also attacks prey 2. Clearly, prey 1 can achieve this by occupying a habitat, or adopting a form or a behavioral pattern, that is sufficiently different from that of prey 2. In short, 'being different' (i.e. niche differentiation) will once again favor coexistence - but it will do so because it diminishes apparent competition or competition for enemy-free space. A rare experimental demonstration of apparent competition for enemy-free space involves two groups of prey living on subtidal rocky reefs at Santa Catalina Island, California. The first comprises three species of mobile gastropods, Tegula aureotincta, T. eiseni and Astraea undosa; the second comprises sessile bivalves, dominated by the clam Chama arcana. Both groups were preyed upon by a lobster (Panulirus interruptus), an octopus (Octopus bimaculatus) and a whelk (Kelletia kelletii), although these predators showed a marked preference for the bivalves. In areas characterized by large boulders and much crevice space ('high relief') there were high densities of bivalves and predators, but only moderate densities of gastropods; whereas in low relief areas largely lacking crevice space ('cobble fields') there were apparently no bivalves, only a few predators but high densities of gastropods. ... in gastropods, bivalves and their predators . . .
increased number of predators, and hence increased predator-induced mortality. An experiment with a similar aim involved removing a common leaf-mining fly (Calycomyza sp.) and its host plant Lepidaploa tortuosa (Asteracea) in replicate sites in a tropical forest community in Belize, Central America. Other leaf-mining fly species that shared natural enemies (parasitoid wasps) with Calycomyza, but whose host plants were different, demonstrated reduced parasitism and increased abundance (a year later) in the removal sites than in the control sites (Morris et al., 2004). 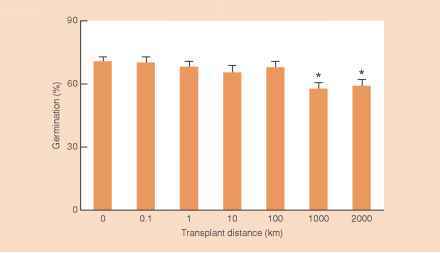 These results support predictions of apparent competition, involving a shared natural enemy, in a situation where interspecific competition among the fly species for host plants could not occur. impacts (see Chapter 13). Species 1 and 3 then have indirect negative impacts on one another without sharing a common resource or, for that matter, a common predator. They exhibit apparent competition, although not for enemy-free space (Connell, 1990). reduced exploitative competition for water in the former case (Robertson, 1947). However, the herbs in the larger site also experienced greatly reduced grazing pressure from deer, rodents and insects, for which the Artemisia bushes were not only a source of food but a place of shelter, too. The outcome is therefore equally likely to have resulted from reduced apparent competition. This emphasizes that the relative neglect of apparent competition in the past has been unwarranted, but also re-emphasizes that the distinction is important within interspecific competition between pattern on the one hand, and process or mechanism on the other. In the past, patterns of niche differentiation, and also of increased abundance of one species in the absence of another, have been interpreted as evidence of competition too readily. Now we can see that such patterns can arise through a wide variety of processes, and that a proper understanding requires that we distinguish between them - not only discriminating between distinguishing pattern and process conventional and apparent competition, but also specifying mechanisms within, say, conventional competition (a point to which we return in Section 8.10). How is predator mediated competition different than apparent competition?